Orzo with Green Garlic, Mascarpone, Thyme for Cooking easy side dish. Cooking this small pasta in just enough liquid gives it a creamy texture, almost like risotto. Stir in the Mascarpone at the end for a luscious finish. Trim green garlic, slicing off the root and removing 1 layer. Thinly slice as much as you can, including the green tops. OR trim the green onion the same way and slice. Briefly sauté green garlic (or onion) in oil in a small saucepan. 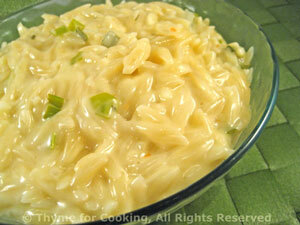 Add orzo, wine, stock, cover and cook until all liquid is absorbed, 12 - 15 minutes.